When it comes to translating technological innovations into real business results, technology is relatively easy to come by; it is talent that is often the limiting factor. Companies have to simultaneously fill today’s roles and plan for future ones, most of them non-existent at the moment. Indeed, in a survey we conducted for the forthcoming book Goliath’s Revenge we found that only 27% of small companies and 29% of large companies believe they have the right talent for digital transformation. Through our research we also uncovered six strategies companies can employ to ensure they have the people to accelerate digital innovation. Though it can be tempting to focus on new technical talent in a digital transformation, the better approach is a model that integrates new digital talent with the domain knowledge that comes from legacy employees. And it’s important to provide the right structures, incentives, and rewards to enable high performance in these integrated teams. Beyond the designers, developers, and data scientists that everyone is battling for today, companies must explore what new roles are likely to emerge in digital disruptors. These may include product incubation managers, behavioural scientists, journey mappers, business modellers, solution finders, and emerging tech specialists. Maybe soon you’ll need an AI specialist in your HR department – and if you will, the time to think about it is now. Once you’ve identified the skills and roles, invest in building the right talent ecosystem, which will typically include internal people, external hires, partners, and freelancers. It will be critical to empower your employees with continuous digital learning programmes, job mobility, and skill grafting to retool themselves and play their part in transforming your organization. Most general managers who are skilled at running an existing business unit or function don’t have the necessary entrepreneurial or digital skills to also drive a disruptive innovation opportunity. The ideal leadership profile for people driving those parts of the business, especially for future roles, is what we call a “balanced T” venture general manager. 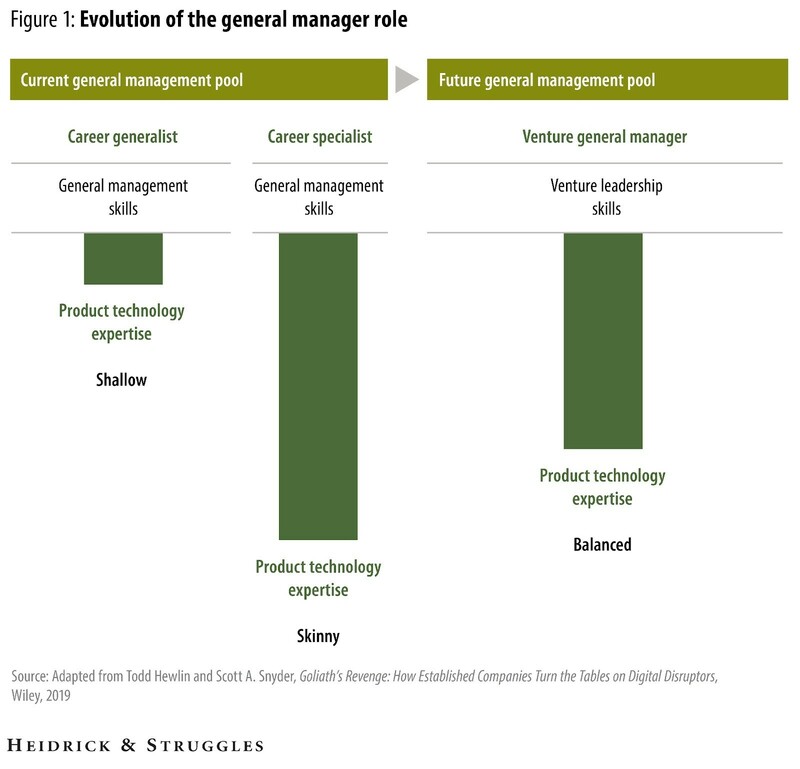 These managers favour skills such as capital raising, design thinking, lean startup execution, calculated risk taking, creating go-to-market strategies, and venture scaling, in balance with product and technology expertise that is directly relevant to the market being pursued. Beyond these competencies, venture general managers, or “intrapreneurs” possess an entrepreneur’s mindset along with the savvy and domain knowledge to navigate the typical corporate blockers and incubate and scale a breakthrough opportunity. If you want to truly keep up with the deluge of AI-based applications and innovation opportunities, you need to quickly find an equilibrium between machines and people. To make the best use of your data, you need to classify which activities should be optimized for machines, which for humans, and which for a hybrid model. This classification involves difficult decisions about reskilling, shaping talent, and ensuring your workforce is the correct size in the face of a future dominated by AI. Putting off this classification effort allows your competitors time to gain an advantage that will be hard to overcome later. Digital dexterity is a measure of how well leaders and teams demonstrate awareness of technology, customer focus, disruptive innovation, an experimental mindset, and a passion for rapid execution. It focuses on the attributes an organization needs to have across its leadership team to enable a two-speed organization – one that is both executing on the current business model and evolving towards a more digital future. 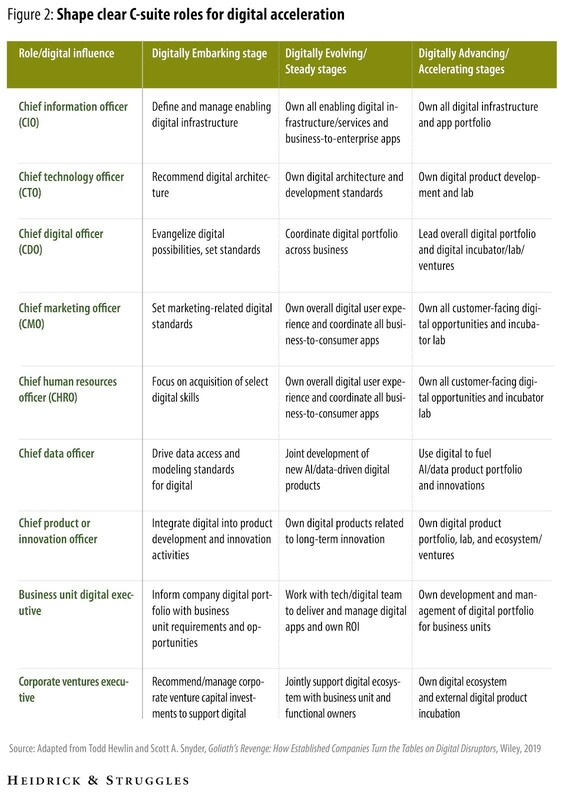 Rather than try to find one digital saviour to own digital transformation, evolve the individual roles of your senior team (as shown in the table below) to leverage digital dexterity and win in a digital future. Obviously, reshaping your workforce to thrive under digital disruption is a challenge, especially given that the digital future is a moving target. And talent, we’ve found, is only one of six major areas companies need to change to create a long-term competitive advantage in the marketplace. The others include delivering step-change customer outcomes, pursuing breakthrough and continuous innovation, using your data as currency, accelerating through innovation networks, and reframing your purpose. It’s a tall order. But starting by having the right people with the right skills in the right roles to win will far outweigh picking the right technology, algorithm, or cool startup to work with. So make sure you get the human part right. Excellent article Scott. I wrote a Linkedin article highlighting the observations in my field of what I call a “knowledge gap”. Even though we know we should retain institutional knowledge, the change in the market diluted the legacy employees leaving this gap. New technology emerging give us a sense of confidence however, if you look below the surface of reporting you will find very little retention of the origins of the knowledge. Do you think that as technology becomes more dominant that we as humans will become disengaged from the original algorithms?